But we were still puzzled. Why was a mikveh in Long Beach needed so badly? After all, there were only a few women who kept this mitzvah and they had no difficulty traveling to Los Angeles. Why would we need to build a mikveh at all? Clearly, however, this was something the Rebbe wanted us to do, so we started to plan what seemed like a monumental project. Raising the necessary funds in a community in which mikveh was not a household word was, to put it mildly, daunting. But Rabbi Shmuel Dovid Raichik, the Rebbe’s emissary in Los Angeles said he would help us raise the initial funds. This made the formidable, possible, and that winter, another emissary, Rabbi Gershon Schusterman took the lead to move the project along. As winter turned into the spring of 1972, the Rebbe’s seventieth birthday was coming up and chasidim the world over decided to give the Rebbe a number of special gifts: they each committed to learn Torah for seventy hours; they committed to spend seventy hours in outreach to their fellow Jews; and they committed to donate seventy dollars per each member of their families for the charities which the Rebbe would choose. During the celebratory farbrengen, the Rebbe asked for one more gift – that seventy-one new institutions be established in the coming year. He urged his chasidim not to rest and he stressed that he, despite being encouraged to rest or retire at his age, had no plans to do so; in fact, he planned to increase his activities. He said that he would become a partner with those who took upon themselves to establish one of these institutions and would fund ten percent out of the monetary gifts he had received. Although our project was already underway, we requested that it be recognized as one of these seventy-one new institutions, and to our delight, our request was granted. This also helped our fundraising efforts. We approached Mr. Berel Weiss, a major Los Angeles philanthropist, who agreed to pay the monthly mortgage on the mikveh building. And we were off and running. We sent regular reports to the Rebbe who wanted to receive monthly updates. These reports were to be marked “Campaign for the Seventy-One Institutions” so they would stand out among his other mail. Since the Rebbe’s birthday is on the 11th day of the Hebrew month of Nissan, we sent our first report on the 11th day of Sivan, noting that we had spent five thousand dollars and immediately received a check for five hundred dollars – the promised ten percent – from the Rebbe’s office. Our mikveh would end up costing seventy thousand dollars (the equivalent of half a million dollars in today’s money) because we decided that we should go the extra mile in decorating it. We wanted to attract all the Jewish women of Long Beach and the surrounding area. With the help of consultants, we succeeded in this goal – the mikveh we built was elegant and attractive. When it was ready, we held a community-wide open house. One of the women who came, just out of curiosity, went on to write a letter to the local Jewish newspaper. She described how her mother had warned her that mikvehs were dirty places, but that our mikveh was a spa! In this letter, she challenged everyone to come see this mikveh for themselves. The overall reaction was so positive that we started a series of lectures on the significance and importance of the mikveh. And then, when we saw what kind of an impact the new mikveh was having, we decided to spread the idea. I wrote an article entitled A Miracle in Long Beach California, which received national attention. In response to popular demand, we put together a packet describing what we did and how we did it, and we sent it to every mikveh committee in the United States. Many asked for our architectural plans, some asked for suggestions on how to beautify and upgrade their mikveh, and others wanted to know what the best methods were to reach out to their communities. From coast to coast, Jews were calling and writing letters, asking how they could do what we did. We heard from the Satmar community in Brooklyn, New York, from a little town in Ohio, and everywhere in between. We also got visitors. Rabbis came to personally investigate how they could improve their own community’s mikveh, and a whole committee from San Francisco flew down with the same idea in mind. Just locally in California, our mikveh gave birth to several other mikvehs. In Berkeley, the first redwood mikveh was built; in the San Fernando Valley the first solar-heated mikveh was built; and in Los Angeles, the existing mikvehs upgraded their décor while plans got underway to build a new mikveh to match the beauty of the one in Long Beach. It was an idea whose time had come, and community after community decided to beautify and upgrade its mikveh. In addition, Mrs. Marlene Levine and I founded an organization called The Jewish Family Institute to spread Jewish family values with an emphasis on Taharat Mishpachah. And, even though it took a while, more and more women started using our mikveh. It was only then that it dawned on me why the Rebbe found it so important that we establish a mikveh in Long Beach. Our mikveh literally launched a mikveh revival throughout America! 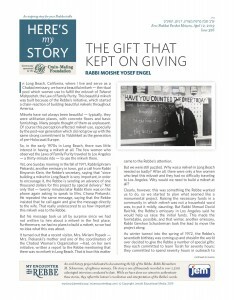 Since 1970, Rabbi Moishe Yosef Engel has served as a Chabad emissary in Long Beach, California. He was interviewed in September of 2011.